What Exactly Qualifies As An Ultrabook? 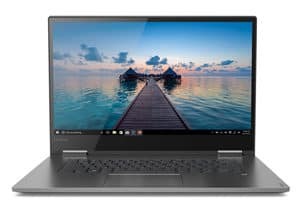 What Features Should I Look For In An Ultrabook? 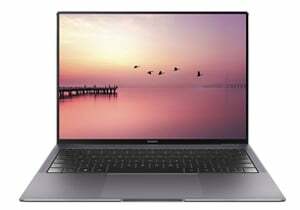 What Sort Of Battery Life Can I Expect From An Ultrabook? A relatively new option in the portable computer world, ultrabooks combine sleek and stylish designs with high end functionality. 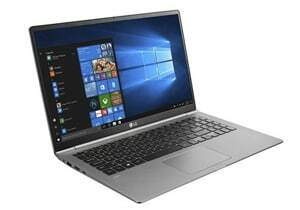 These super slim laptops are well under an inch thick when closed, and usually include touch screens and top-of-the-line specs. Not sure which ultrabook is the right model for you? Let’s take a look at what’s currently available with the five best ultrabooks on the market! 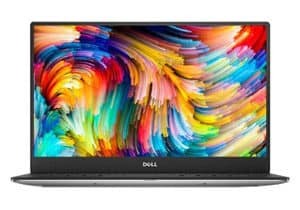 First and foremost, you should expect a higher price than your average laptop computer when choosing an ultrabook. There are a few options that are budget-friendly, but most of these machines are over the $1,000 mark. In exchange for that higher price tag, a buyer can expect extremely lightweight machines. Your average ultrabook is in the two to three pound range. These devices are meant to be effortlessly carried around college campuses, office cubicles, or between home and work. Because of their high prices, you also tend to get specs that can even outclass full desktop machines. If you are going to spend a grand or more, be sure you are getting your money’s worth! Although there are exceptions for certain feature trade offs, in general you should try to stick to 16GB of RAM and a large solid state drive with any ultrabook. Need a thin and light laptop with decent specs that won’t break your bank account? This should be your pick for the best budget ultrabook. Alright, so we’re actually fudging a little bit here. 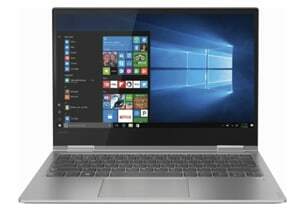 The VivoBook usually retails at $509.99, but it does go on sale and you can find special offers through Amazon to lower the price. Honestly though, you don’t want to go cheaper than this when looking for the best ultraportable laptop. Anything under this price range is going to feature simply unacceptable specs. This particular model is the baseline for what you should expect from any slim and lightweight device. Due to the extremely thin bezel design, ASUS managed to fit a 15-inch diagonal screen into a 14 inch frame. At 3.7 pounds and well under an inch thick, this is much lighter than your typical work or school laptop. With an 8th gen processor and 8GB of RAM, you get great specs in a thin and light package. Unfortunately you end up with a hard disk instead of a solid state drive, which is the main downside to going this cheap and the biggest complaint from buyers. For those who don’t mind getting their hands dirty, you can always switch to an SSD manually to overcome that issue. 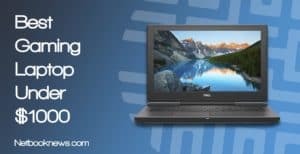 Want a super thin, amazingly portable computer but not quite willing to spend above three figures? This should be your pick for the best ultrabook! When you’re willing to bump up the price tag, the specs on ultrabooks skyrocket into the stratosphere while the weight plummets. The Lenovo Yoga is just over two-and-a-half pounds and 0.6” thick. That’s significantly lighter and thinner and the already-lightweight VivoBook listed above. Going with an ultra portable design offers the opportunity for hybrid features as well. This particular model has a 360 degree swivel hinge, meaning you can use the touch screen as a tablet. You don’t lose out on much in terms of hardware even by going this thin, either. There are really only two potential downsides here. First up, this model doesn’t have a built-in card reader, which is often mentioned by buyers who ended up having to get an external SD card slot. Second, all of the other contenders below have much more than 256GB of storage space. 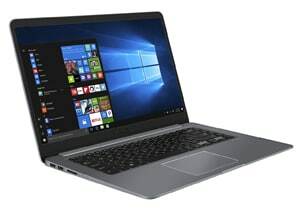 If you decide you want to go above a grand, this same model is available in an alternate configuration with 16GB of RAM and a 512GB SSD instead. Want the absolute best 13 inch ultraportable laptop out there that can also double as a tablet with a stylus? This should be your pick! The HP Spectre essentially doubles the specs from the Lenovo Yoga contender listed above, and is even thinner! With 16GB of RAM, an 8th gen processor, and a 512GB SSD, this model outclasses quite a few high end desktop machines. You pay a premium for those specs, however. You won’t find this model anywhere close to under the $1,000 mark. Like the Lenovo Yoga, you can flip this ultrabook around and use it as a tablet. The Spectre even includes a stylus and is designed with Microsoft Ink in mind. When you need a hybrid device, you won’t find many with better specs of features. Of course by going this thin you lose out on the DVD drive, but that’s a small price to pay. The Spectre also includes a fingerprint ID scanner. You definitely want that feature when you’re investing this amount of money on a laptop. Buyers frequently mention loving the distinctive dark ash and gold color scheme, but note the fans run more frequently than other ultra thin models. Although it probably won’t matter at this price point, but there’s another consideration here to keep in mind. The battery for the HP stylus can’t be plugged in to charge. That means you’ll need to buy a fairly steady supply of disposable AAAA batteries, or invest in a rechargeable set. Want an ultrabook that’s slim and light but still has at least a 14 inch viewing screen? This should be your pick! Ultra lightweight units tend to start at 13 inches, with some even going as low as 11 for the ultimate in portability. 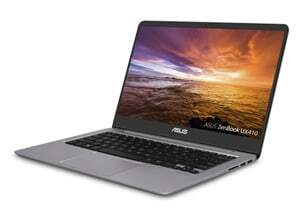 Some users prefer a bigger viewing area though, and that’s where this Asus ZenBook comes in. You get a bigger screen than your average 13 inch portable computer, but it’s still extremely light at 3.1 pounds. That extra inch gives you more than just a wider display screen, as well. With two drive slots, you get both an SSD and an HDD. That means you’ll have blazing fast boot up speeds and plenty of storage space. There is a trade off on the RAM, unfortunately. Most high end ultrabooks will come standard with 16GB of RAM, so you lose out on the memory front. That issue can be mitigated if you expand the memory later on. This machine’s motherboard comes with one 8GB stick, and can handle a second for a total of 16GB. Buyers often praise the lightweight, space saving design. There is one downside they mention in that design, however. For some reason, the power button is a keyboard key, and it’s positioned right next to the Delete key. Don’t be surprised if you accidentally put your computer to sleep a couple of times while getting used to that keyboard layout. 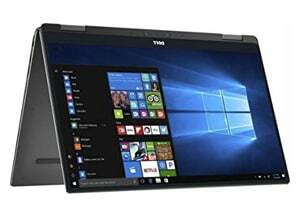 Want the full viewing area of a normal laptop while maintaining the extremely thin and lightweight design of an ultrabook? This should most definitely be your pick! 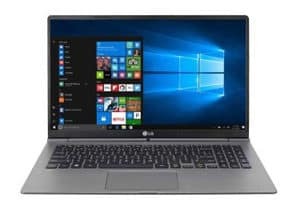 The LG Gram isn’t just the best 15 inch version of a portable laptop — it’s also one of the best ultrabooks available, period. This is one of the lightest, slimmest devices available on the market. Despite weighing less than 2.5 pounds, it still manages to fit a full 15.5 inch display just like a standard laptop. 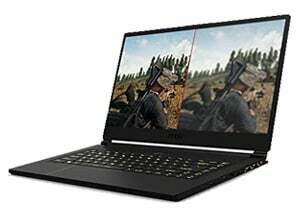 It also sports an incredibly slim bezel, so you actually get more viewing area than with your typical 15-inch notebook computer. Like most ultrabooks, there just simply isn’t room for an optical DVD-RW drive here. That’s not a big issue though, because you get three USB 3.0 ports, a USB Type-C, HDMI, and MicroSD ports. Because this is a 15 inch model, the keyboard sports a full 10 key side pad. 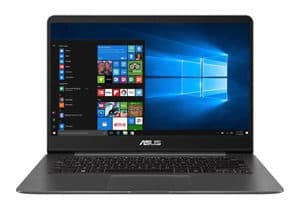 Like with the Asus ZenBook, the power button is on the keyboard, but its in the far top right corner and clearly marked..
Two primary complaints are brought up by buyers who reviewed the Gram. The screen is glossy rather than matte, which some users find less pleasing to the eye for viewing videos. The speakers are also positioned underneath the laptop, rather than on the top or side. That’s not usually a design you see unless you are getting a 2-in-1 machine, which isn’t the case here. What that means is that you’ll get slightly muffled sound if you aren’t using headphones or an external speaker setup. 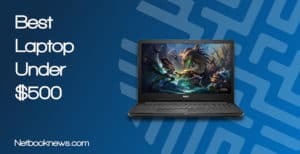 Want the thinnest possible notebook while still having the graphical power necessary to run AAA games at high settings? This should be your pick! It’s not often that you’ll find a portable ultrabook that also happens to be a VR-ready gaming powerhouse. 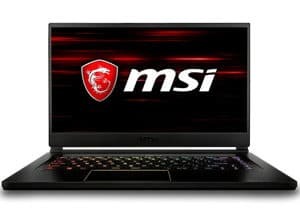 That’s what you get with Stealth Thin version of MSI’s GS65 laptop. It is slightly more heavy than the other contenders, but not by much. That’s simply a concession that has to be made to get a dedicated graphics card, though. This unit remains incredibly thin, at less than an inch thick. Other contenders in our lineup have more storage space, but none have even close to the graphical power. With a GeForce GTX 1060 and 16GB of RAM, you can expect to play pretty much anything on high settings. No one will ever mistake this for a simple school computer either. You get a striking black and gold design here, along with a full RGB keyboard. There are a few downsides to take note of when picking an ultrabook for gaming. Most notably, they are going to have less battery life. In general, gaming laptops are meant to be played while plugged in, which is a trade off for the portability. Unless they are in our laptop with longest battery life list. Laptop speakers also just aren’t going to be up to par of an external set on a desktop machine, and that’s a fact referenced often by reviewers. If you play games where sound matters — like listening for footsteps in a Battle Royale title — you’ll want to get headphones. Do you intend to use your ultrabook for both work and gaming? Don’t forget this model has an optional Office 365 bundle available through Amazon as well! Need ultra portable, ultra high end machines with no bloatware for your office? This should easily be your pick! If you’ve seen the term “signature edition” before but weren’t sure what it meant, you certainly aren’t alone. 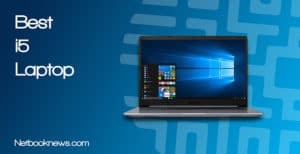 For an ultrabook, it means you’ll pay more but in exchange get a completely clean installation with no bloatware of any kind. For business users who need speed and a clean copy of Windows, that’s a huge bonus. That’s just the start of the high end features here, though. Notably, the MateBook X Pro includes a “full view” display with almost no bezel at all blocking any screen viewing area. The power button doubles as the fingerprint scanner, so with one touch you are signed in and ready to go. That’s a feature you can expect to see many other manufacturers start to mimic in the near future. For office settings, this machine has very high battery life that will have you working a full day — even on overtime — with a single charge. In another design innovation you can expect to see become standard, this model uses a privacy-focused pop-up camera. An employee has to actually tap the camera on the keyboard to bring it into view, which offers better security. Despite its thin profile, this model also includes a dedicated graphics card. That makes it perfect for an office where you are running high end video editing or CAD software. 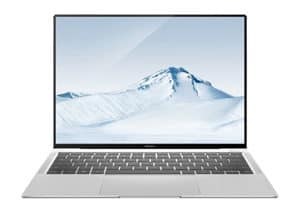 The MateBook was so popular at launch that Amazon actually ran out of stock in May – June of 2018! 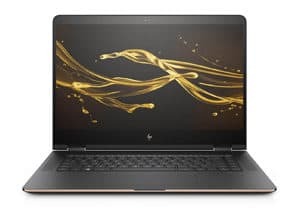 As with any laptop, there are a few issues that buyers weren’t crazy about, however, two issues are brought up by reviewers more often than any other criticisms. The security webcam is a nifty feature, but since it’s positioned at the keyboard, it offers an oddly low view during video chats. The second main issue is that you tend to get a lot of coil whine and fan noise with this model. Keep that in mind if you tend to use your laptop in a quiet location. When high battery life is your main concern but you still want an incredibly lightweight machine with good specs, this should be your pick. In terms of sheer operational time and battery power, it doesn’t get much better than the XPS. The hybrid 2-in-1 style and lightweight design give you up 15 hours of usage for most tasks. With 16GB of RAM and a 512GB SSD, you still get excellent overall specs even with that insane battery life. Unlike the HP Spectre listed above, this unit doesn’t include its own stylus. If you want to use this as an Ink tablet, be sure to pick up a Dell stylus as well. Don’t care for the hybrid 2-in-1 design but still want to use your ultrabook all day long? Keep in mind that the Huawei MateBook X Pro and LG Gram also have astonishingly high battery lives. An ultrabook (or ultra portable notebook) is a fairly catch-all term at this point that doesn’t always have exact specifications. Anything thinner than your average full size laptop can technically apply here. In general, you want to go with three pounds or under to truly get the thin ultrabook experience. There are a few exceptions though, like if you are specifically looking for a gaming machine. In that case, the “stealth” options from gaming computer manufacturers signify an ultraportable. Stealth versions are usually in the low four pound range, which is still quite a bit less than your average five – six pound laptop. Besides just weight, the thickness also has to be taken into account. Generally, an ultrabook means something under an inch, with half inch models becoming increasingly popular. Despite their extreme portability, ultrabooks tend to have two main downsides. Getting high end specs in a lightweight package means the price goes up, significantly. Due to their compact designs, ultrabooks also tend to experience a phenomenon known as “coil whine” more frequently. This means the internal electronic parts vibrating creates a noticeable sound even when there isn’t a cooling fan actively in use. As with nearly any laptop, your baseline for specs should be 8GB of RAM and a solid state drive. An 8th gen processor is always better for lower power consumption and faster install speeds. From there, it all depends on what you need from your computer. Most ultrabooks ditch the optical drive entirely to save space. That makes sense, because drives take up space and ultrabooks needs to be as thin as possible. Since you can’t use DVDs, that means you want to take into account the specific ports available in an ultrabook. In general, 3 USB ports and a card reader are the best ways to go for the most data storage and external peripheral options. If you need to connect to an external display, don’t forget to look out for an HDMI port. In most cases, ultrabooks strip out larger moving parts and use a slimmer design with smaller screen size. 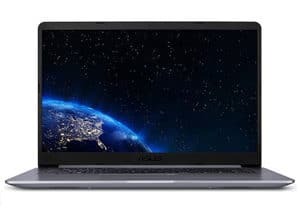 Usually, that means ultrabooks tend to have better battery life than their larger counterparts.That isn’t always the case however, so pay careful attention to the specs before buying. 8th gen processors and smaller screens help keep the power consumption down. 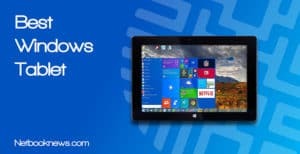 Some ultrabooks still stick to the 15 inch design though or even have 4k screens, so they may not have high battery life. Keep in mind that the hours of usage listed by manufacturers are usually estimated on streaming videos with the brightness turned down. If you keep the screen brightness at max, have a backlit keyboard, and are playing games, your battery life plummets. Did you find the perfect thin and light laptop in our lineup of contenders? 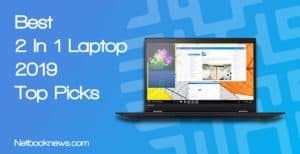 From 2-in-1 hybrids to full size 15 inch devices, one of these should be the best ultrabook to fit your needs and budget! Be sure to let us know which one you think is the best ultrabook, and leave a comment if you’ve found a better option we didn’t list here.